Speaking at a thanksgiving service organised to mark her 50th birthday at the Chapel of Praise International Church, Yola on Sunday, Mrs. Binta Masi Garba, a Nigerian Senator representing Adamawa North Senatorial District in the red chamber, recounted her property was burnt down by her biological father after she gave her life to Jesus Christ. Senator Binta who spoke about the turnaround which made her the cornerstone in her family as she broke down in tears during the event, the Senator stated she got all she has now after deprivation and rejection she suffered for accepting Jesus Christ as her Lord and Saviour. “I gave my life to Christ when I was in primary school. My father was infuriated and he burnt everything I had because of my decision to follow Christ. I suffered so much because of the name of Jesus. I would have been nothing if not for His grace. The rejected child, because of my faith, has become a cornerstone. I give glory to His name” she said. Osinbajo further stated at the event which the Minister of Transportation, Rotimi Amaechi, Boss Mustapha, Senator Nelson Effiong, who represented the Deputy Senate President Ike Ekweremadu, and the Founder, Chapel of Praise Church International, Archbishop Fred Addo attended, that President Muhammadu Buhari had appointed some of the finest Christians in his government in order to bring change. “God is not moved unless we move His hands in the place of prayers. We are in a period in history when God wants to do something that is why some of us are in government. The opportunity must not be lost, your prayers to God will make that difference” he said. 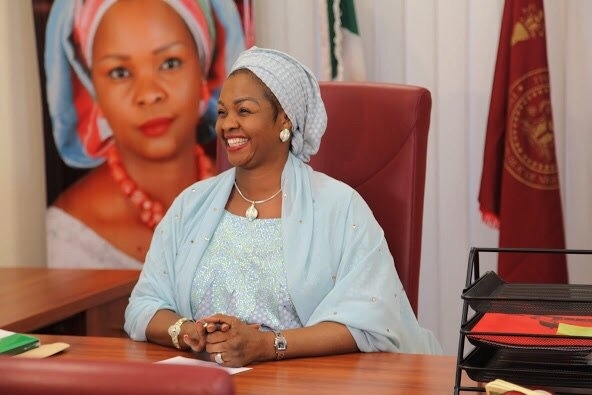 The senator for Adamawa North senatorial district of Adamawa State and mother of three was the first woman in Nigeria to become state chairman of a major political party. That was when she emerged chairman of the Adamawa State chapter of the All Progressives Congress. Thereafter, Garba joined the race for the senate in last year’s general election, where she defeated the then sitting governor of the state, Mr. Bala James Ngillari. Garba is the only female senator from the North in the eighth senate and one of only seven women that made it to the Red Chamber at the last general election. Fondly called “Queen of the Red Chamber” by her colleagues because of lively manners and influence, she is the chairman of Senate Committee on Tertiary Education and TETFund. Coming from a society where many people live in poverty and women are largely relegated, while the girl child is mostly denied education, Garba is acutely aware of the importance of bracing up and facing the harsh realities of life. “I used to go to school on empty stomach, sometimes, I had just water,” she says regarding her childhood in the rural backwaters of northern Nigeria. “One chilly morning, on my way to school, a schoolmate and her father, riding on a bicycle, splashed muddy water on me as they rode past. Garba says she often sold bread and Akara (beans cake) to support herself as a child because she was literally rejected by her parents following her conversion from Islam, the religion of her parents, to Christianity. Yet she says her parents made frantic effort to give her the best that their meagre resources could afford. But today, that rejected child has become a vital person in the lives of many. Garba’s journey to the senate seems to follow the story of her childhood, as there was really an outside chance of her success in the race at the beginning. Garba was born April 17, 1967 to the family of Corporal Garba Tumba (rtd) and his wife, Hajiya Hauwa Masi Garba, in Kaduna State. Her parents are Higgi by tribe from Bazza District in Michika Local Government Area of Adamawa State and her father was the driver of President Muhammadu Buhari when he was a military Head of State. Garba attended Army Children School, New Cantonment D, Hayin Banki, Kaduna; Government Day Secondary School, Kurmin Mashi, Kaduna South, Kaduna State; College of Administrative and Business Studies, Kaduna Polytechnic, Kaduna State; and Harvard University, J.F Kennedy School of Government, where she obtained a degree in public finance. Before going into politics, Garba worked as an advert executive with New Nigerian Newspapers. At a point in the job, she says, she was a victim of gender inequality, when a colleague of hers was promoted and she was not, just because she is a woman. That incident was the turning point in her career, she recalls. Seeing a seemingly bleak future in the job, and with her strong resolve to impact on her world, Garba decided to venture into politics, particularly with the aim of fighting against the stigmatisation of women. In politics, her experience in the media and exposure got her a lot of mileage. She has become an authoritative voice for women in the country and abroad by dint of hard work, resilience, willingness to listen to wise counsel, and determination to succeed. Garba says she is in politics to do great things – not just to be someone great. “She believes that every woman is exceptional and not created for the sole reason of holding or playing her family roles; but every woman must have a voice,” an excerpt from the programme of activities during her thanksgiving reads. And it was for this reason that she went into politics in 1998, when she contested, though unsuccessfully, for the House of Representatives on the platform of the National Centre Party of Nigeria in Kaduna South, a place where culture seemed to forbid women from playing any prominent roles in politics. In 1999 Garba was elected to the House of Representatives under the auspices of the All Peoples Party to represent Kaduna South Federal Constituency for two terms, from 1999 to 2007. A woman of deep passion for the empowerment of the less-privileged and disadvantaged persons, Garba was elected to represent Madagali/Michika federal constituency of Adamawa State in the House of Representatives in 2007. She established the Binta Masi Garba Foundation based in Yola as an avenue to reach needy people in Adamawa and other parts of the country. 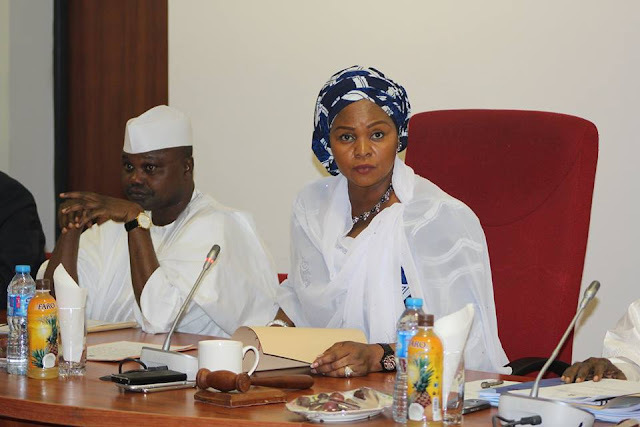 While in the House of Representatives, Garba chaired and served in several committees and sub-committees. She was chairman of Infrastructural Development, Appropriation Committee; deputy chairman, Anti-corruption, Ethics and National Value Committee; chairman, Inter-Parliamentary Relations Committee; and chairman, Women Affairs Committee; as well as member, Defence Committee. Besides serving three terms in the Green Chamber from 1999 to 2011, Garba was the national deputy publicity secretary of the Peoples Democratic Party and later national woman leader of the breakaway New Peoples Democratic Party. She was vice-president of the Commonwealth Women Parliamentarians (African Region). Garba believes it is time to support the womenfolk to be at the helm of affairs in the country. She vied for the position of senate president for the eighth senate, but lost in the highly acrimonious contest.